Aloha and Greetings from the Kauai Pacific Real Estate Team! Our team of real estate, vacation rental and property management professionals have been serving the needs of our owners, guests and clients since 1997. We know Kauai inside and out. We all share the wonderful gift of Aloha! Some of our employees and team members were born and raised on the Garden Island. Others have made their home here for ten years or more. This is an island and a life style we love and cherish and look forward to sharing our expertise with you. Kauai Pacific Real Estate is a full service real estate company. We have experts in the field of real estate sales and purchases, the island's best team of vacation rental experts, and we are one of the largest managers of privately owned long term rental properties on the island. Unlike most other property management companies, we handle every aspect of property care for our owners and guests. We not only have our own cleaning services, but we also have our own laundry facilities. We feature in house maintenance as well. Whether you are a guest or an owner we can meet your every need. And unlike companies that operate from the mainland, our services and employees are all located right here on Kauai where we can respond to your every need quickly, efficiently, and in the Hawaiian style! 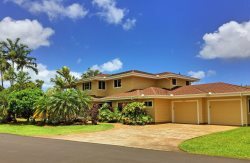 Whether you are looking for a place to buy or sale, or if you are looking for that perfect vacation rental property or long term rental, or if you are looking for someone to manage your property for you please give us a call and let's talk about why we believe our team is the best one out there to meet your every Kauai Real Estate need!